I'm on my second set of brand new O'reilly's axles, not as bad as the first set, but they're still vibrating. I have a gallon of Valvoline conventional 5w30 on the way along with a Bosch distance plus oil filter. What I'm currently running. Late this week, probably Saturday I will roll it in the shop. Should be pretty easy to accomplish in a day with a full blown shop with a lift at my disposal. Left this car in Missouri. Left it with my father who I know will take care of it. Plus at his property its behind 3 gates in the middle of 15 acres. So I know no one will mess with it. Wish you would've left it in missouri, at my house! My father has been good to me. If I never return home he'd be the one person I'd feel comfortable having it. It's not a bad car. Little rusty. But it's got good parts. A rust free chassis in the future if I ever found one it would make a great parts car. Only thing that's shot is the chassis. Everything else is awesome. A lot has changed this year. It's been stressful, good, hard, rewarding and so forth. I'm changing career paths very soon. Which is cool. Definitely a positive step. But I guess life styles revolve around ones career to a large degree so to speak. For me it's like that anyhow. I'm not going to be doing much for the next 6 months. Nothing actually automotive related. The reason being is I've signed a 6 month lease here in Jackson. So I live in an apartment. Kinda scales things down for me at the moment. The sad thing is I live in a studio and it's right around $1500/mo. Seriously. So I'm financially tied as well. In the spring I'm going to be getting into a home around here. With a shop and or garage for my projects to take place. Once again. However, I'm thinking of doing something a little more my own. I'm thinking of maybe a blog? Youtube channel maybe? Both? Something along those lines. I kinda do my own thing here, kinda stray down my own path. Which is kinda who I am. So yeah, that's where things are headed. I will be leaving everything I've contributed on the forum, not taking anything down or away of course. I hope some of my input has helped people and continues to. I chose to post this here as I doubt I will ever see this car again. Kinda another reason for moseying on down the path. It will very likely end up permanently with my father. I've spent so much time and energy on the 4G Accord chassis. I'll forever like it. But I'm sure enough that I won't be getting back into the scene. I've had some great runs. But it's time for me to move on. I really want to get started on my Talon. The anticipation has been building for a couple years almost now. I'm not saying goodbye just that I'm moving on into some other things. When I get a platform, whatever that may be I'll let you know. That will be in the spring at the absolute earliest. Still got it. Plan on buying a couple newer vehicles this year. Here's some cool pics. Just a couple places I went in this car. Hey Josh unsure if you remember me but I'm glad to see your still into cb7's lol. I used to have 4 cb7's but went down to 2. My 1990 CB7 first one I ever bought is still running and driving at 260k.. honestly still on the same timing belt it had at 180k...cars been through some rough times and I am considering doing the timing belt but the exhaust is still falling apart even after putting a lot of money into the exhaust... think I've had the car for 8 years now. Got into many other cars and when I have time I may make a post of cars I've had in the past few years..many Acuras, Hondas and Lexus"s lol. Yeah I remember you. Took me a minute. Glad to hear that your alive and well and having fun! Taken somewhere in Idaho on the way to Idaho Falls from Jackson Wyoming. Man that thing is nice! Cool car, I love seeing them in all stock condition like this! Post up links if you start your project documentation through other places, I would like to follow. You always do quality work. Thanks! It's rusty on the back end. Iowa salt got to it unfortunately. Other than that it's pretty decent though. 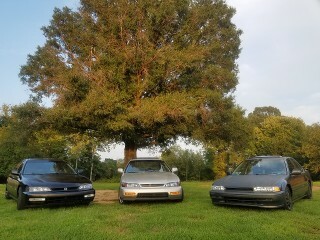 It's very stock. Lol except for the exhaust system. It's still in the works. I've been delayed a bit financially but that's ok. Nothing goes as expected all the time. I have made many steps towards this during the past 6 months. I honestly can't wait. However work comes first. I hate being responsible sometimes but it is what it is. Glad to know I have your appreciation! I'm not the best at anything but I have the best intentions. Thanks again man! Time for some maintenance. Probably going to be moving again here soon. So having the maintenance done is very important. Oil change is way overdue. Shame on me for not doing it. I haven't had the ability and shops here charge $100 for an oil change. And a 5 quart jug of cheap oil is $40. Valvoline Conventional 5w30. 5 quart jug. Already have a new in box Bosch Distance Plus oil filter. Bando A/C and power steering belt. NKG G power spark plugs. Mahle Valve Cover Gasket set. Wagner quick stop front pads. And a couple exhaust gaskets. I have a small leak I'd like to fix. This is a cheap tune up. Probably the cheapest I've ever done. But I'm doing it while I know I can. For what the future holds is unknown. Also I still have new in the box CV shafts. Those will be going in. More so to clear room in the trunk. As will the Dorman brake master cylinder. Also I have a complete set of new rear brakes in the trunk as well. Good quality stuff. Everything I have I'm going to be installing next weekend. I'm going to work all weekend until it's done. Many pictures to come. Who knows what else I'll find that will need replaced. Also picked up three bottles of genuine Honda power steering fluid and two bottles of genuine Honda brake fluid. I know it could use both. Last edited by H311RA151N; 07-02-2018 at 11:56 PM. There is a screw in the driverside front tire. It needs air every day or so. On the front passenger side something has been stuck in the tire making a clicking noise for over 6 months. I had looked for it on several occasions. Also, something is wrong with the alignment in the front end as the tires are wearing to the inside. An alignment here is probably about $200 (an average oil change is $100) so I can't bring myself to get it aligned. I also don't have the ability to jack the car up myself and find out. So I bought two new tires for the front. Just to keep it safe until I move and am able to fix the issue correctly. I bought two Kumho Solus TA11 All-Season Radial Tires in 185/70R14 to match the rears. Shame they only lasted a year due to screws, road debris and poor alignment. The tires were $104 shipped for the pair. I'm not happy but it beats someone getting hurt over a $50 tire. I have been noticing the wear over the past 6 months. It hasn't progressed quickly. So new tires will buy me enough time to safely fix the issue before ruining the new tires. Tires will be here Wendsday. I had the new front tires installed today. Cost me $47 for mounting and balancing two tires. I also changed the oil and oil filter. As well as the air filter which needed it. Man, very cool car, I like simple, clean stuff. Very nice pics you have in here too. Well done sir. Only thing I will say is I am not a fan of the hood bra. I'm moving 1300 miles to the East today. Actually right now I should be resting for the 18 hour drive to come. But anyhow, I was organizing the trunk yesterday evening and realized the whole back end of this car is gone. I knew it was bad but it's gotten worse rather rapidly. Even with the trunk interior pieces intact as it came from the factory there are so many places that the ground beneath the car can be seen through the trunk floor. Sadly this cars days are numbered. I need to locate a good shell sometime within the next couple years. For safety reasons I'm going to have to retire this car later in the year. It will be parked and saved for parts. I don't remember where I got the bra... I think I'm just used to it by now. It's a shame, the car looks fairly clean aside from the obvious rear quarter rust. However the cancer is so much worse than can be seen. Your compliments are appreciated however! Hopefully the parts will bring life to another CB someday. Where you moving to? I have a complete rust free driver side quarter panel for the "Rescuing Ruby" repair; although the older Ruby gets, the more she might need it again. I could probably get away with patch panels still. This car is past repair panels unfortunately. Car made the trip without issue. Almost 25mpg. Impressive.